Fans of footie accumulators are going to love the new Football Jackpot promotion from Coral – where a bet of just £1 could win you at least a hundred big ones! The jackpot is set to run every week throughout the 2013-2014 season and pays out if you correctly pick the win-draw-win outcome of 15 matches, with consolation prizes for getting 13 or 14 winners. The Football Jackpot is actually a form of pari-mutuel betting where all of the entry money goes into a pool, minus a commission that is paid to Coral in exchange for running it. Each week the prize money will be chopped up and distributed to the winners as dividends – so the more people play, the bigger the prize fund and the less people win, the more each winner gets. Jackpot Pool (15/15) – Minimum of £100,000. The actual amounts for each dividend depend on the number of entries for that week – the figures we’ve given are based on the reported wins that Coral have provided on their results page but the actual dividend will vary from week to week. Just like the dividends, the grand prize for getting all 15 correct is also connected to the number of entries, as well as how long it’s gone without being won – just like a rollover in the lottery, if the jackpot isn’t won the prize money will continue to build until it’s hit. Coral are, however, guaranteeing that the minimum value of the jackpot will be £100k – meaning that regardless of how many people enter, you’ll be in for a very nice pay day if you win! If you want to get involved, you’ll need to head over to the Football Jackpot coupon on the Coral website. 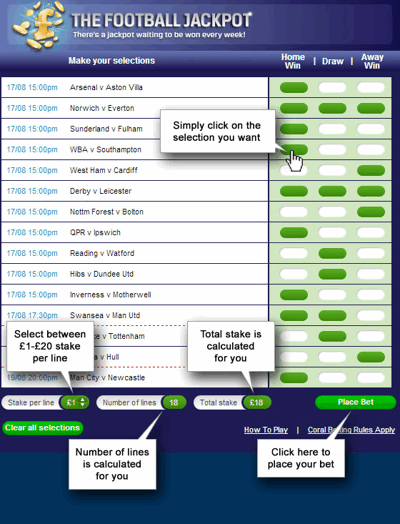 The coupon is made up of 15 matches for which you select the Home Win, Draw or Away Win by clicking the relevant button. If you select one option from each row then this will count as one line and be multiplied by your stake per line to give a total cost. You can, of course, select more than one outcome for any of the games to give yourself a better chance of winning but each unique permitation will count as another line. The default stake per line, and the one that most people will wager, is £1, although you can bet up to £20 per line if you wish – the more you bet per line, the bigger the share of the prize pool you receive if your bet wins. Once you’re happy with your selections you simply have to click the ‘PlaceBet’ button and then start crossing your fingers that a boat load of money will soon be heading your way. When the football jackpot first started, Coral guaranteed that the first single winner would receive at least £1,000,000 (with them topping up the funds in the prize pool if needed). This was won on 28th October 2013 by a team from Colossus Bets. Prior to the big one landing, there were a couple of very near misses, including Kate Muir, the plucky Scottish barmaid who managed to scoop a very respectable £52,000 win for getting 14 correct – and from a single £1 lucky dip, no less. You can check the results for the Football Jackpot on the Coral website and they they list the historical outcomes for all of the weeks since it started. There is also extra information about the most recent weeks results – including the number of winners in each prize group and the relevant payout they received.